The Illustration Friday subject this week is “Wise”. I wasn’t going to post this because I was afraid you would think I’ve totally lost it, but it fit the subject perfectly so here it goes…One morning this past September I was laying in bed meditating. As I came out of the meditation, just for kicks and truthfully never expecting anything to happen, I asked to see my guide or guardian angel. Immediately a woman appeared in the center of my field of vision. 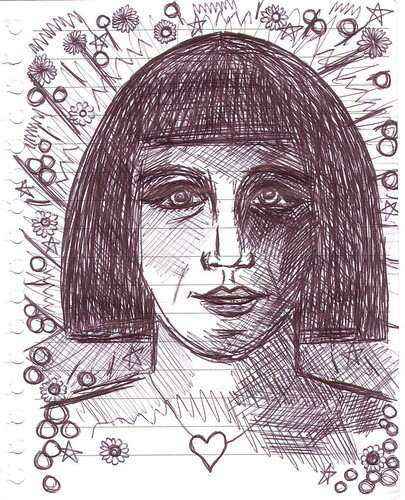 She reminded me of the actress Christina Ricci, she had pale skin and black hair cut in a Cleopatra like bob. It scared the crap out of me at first but the moment I felt the fear she “zapped” me in the chest and I felt this warm, happy energy charge through my body. This energy removed all fear and left me feeling calm and centered. As you probably know my mom died on September 30th. Before she passed away I had several experiences, including the one I’m blogging about today, that enabled me to stay present and be helpful to my mom and dad. I believe that we all have the opportunity to connect with our God, our guides, our Source, whatever you choose to call it in your own personal belief system. We simply need to slow down, breathe, ask and then be still and listen. The answers may not always be what you expected, or even what you want, but they will come. This entry was posted in art, my life, spirit and tagged angels, death, guide, Illustration Friday, life, meditation, mother, prayer, spirit by Lilli Day aka bookbabie. Bookmark the permalink. thanks for the comment,I read how you arrived to this drawing is very interesting. Thanks for your visit and nice comment, speacial thanks for stopping by in my blog, so this way I could find yours. :0) Ale. I think this is totally awesome, and I’m glad you wrote about it. This is a world so full of possibilities and mysteries, it’s wonderful that you can accept them. Interesting post! Thanks for your comment on my blog; I appreciate it very much! The greatest wisdom I have known has not come from books, but experienced when I have been in touch with my highest Self, my spirit Self, my Soul. I have shared many experiences similar to yours, especially surrounding loved ones crossing. The veil seems to be thinner at those times. Thank you for sharing your gift. I am thrilled to know that “crazy” runs in the family. It brings so much peace! Love the drawing of your vision. I don’t think you’ve lost it. I was close to my grandmother who passed away June 07. I have felt a deep connection with her spirit ever since, and I feel she is guiding me through life now, along with Jesus, and giving me much needed wisdom. maybe the apt word is “found” it and not “lost” it… but that is just a happy thought… thanks for opening the world, again, a bit. 07 Oct 03, 2012 2:38 pm I like the valuable info you pridvoe in your articles. I’ll bookmark your blog and check again here frequently. I’m quite sure I’ll learn lots of new stuff right here! Best of luck for the next!